The winter storm – actually three storms in five days – that blew in late last week crippled the region for days and demonstrated the strengths and limits of our regional transportation infrastructure. TriMet crews worked tirelessly for five days to provide transit service during the worst winter storm we have seen in five years. We worked closely with our regional partners throughout this event to keep residents moving as best we could – and to keep them informed. This was no small feat and the credit belongs to our dedicated bus and rail operators, field supervisors, vehicle and system maintenance crews, customer service and communications staff and all the other personnel who worked round-the-clock to provide safe transit to our riders. Our riders deserve credit and thanks as well. The extreme conditions led to significant delays throughout the region. Our buses ran on chains and faced heavy traffic as well as slick conditions at times. The extreme weather also impacted MAX service. For those who had to travel and use transit despite the conditions, most bundled up, stayed patient and understood the challenges our crews faced. More than 200 of those riders went the extra step to send in or phone in their thanks. In an effort for continuous improvement the agency will be holding event debriefs both internally and with regional partners in the coming weeks to discuss what was done well and how we can improve going forward. While it is too early to discuss lessons learned, we have seen some surprising statistics and have a few new records to share. The TriMet website saw record traffic. More customer requests for information came into our website on Monday, February 10, 2014 than any other day in the site’s history. Some 56 million requests came in with the busiest window being the 8:00 to 9:00 a.m. hour. At that time, trimet.org experienced a sustained average of 1008 requests per second. Compare that to the Tuesday after the storm when we saw an average of 610 requests per second, which is typical volume for a weekday morning. We also used our social media channels to inform and communicate with riders. Through Twitter alone we communicated directly with riders and received about 3000 comments in just five days. That’s as many comments as we usually receive in a month’s time. Lastly, we saw a significant increase in downloads of our free TriMet tickets mobile app during the storm compared to prior weeks. We averaged 532 Apple and 235 Google downloads a day during the winter storm, compared to the January average of 191 downloads for Apple and 73 downloads for Google. The storm moved in quickly on Thursday, February 6, 2014, making the afternoon commute difficult for everyone on the road. Buses faced significant delays as traffic gridlocked when everyone hit the road for home at once. Bus operators kept it slow and steady dealing with the traffic and the conditions. The more than 200 buses equipped with automatic drop down chains meant crews didn’t have to chain up as many buses with the conventional chains. For the buses that did need the conventional chains, some were chained up before leaving the garage for afternoon service and maintenance crews met up with others that were in service when the storm came in. Customer service and media relations staff sent out word that buses with chains could not run more than 25 miles per hour. As the snow and then ice continued to pile up in the following days, bus routes were detoured off unserviceable streets. Despite treacherous conditions, our skilled bus operators were able to navigate the roadways safely. 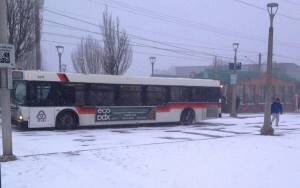 Even though this was an extreme storm, those who have been at TriMet through numerous storms say that we had fewer stuck buses at any given time. That’s to the credit of our operators. 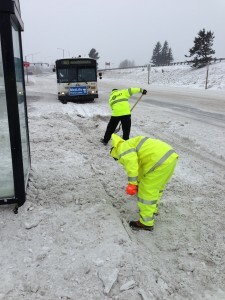 We also want to recognize our field crews who were able to get buses unstuck quicker than in years past. The automatic drop down chains on our newest buses and retrofitted on some other buses, made it easier for crews to get moving if they did get stuck. Of course, credit is also due to our city and county partners as well as ODOT that continued to plow and sand major transit corridors. Field and maintenance crews were out round-the-clock throughout the storm addressing any issues that came up, whether it meant responding to a bus that became stuck for a time or manually clearing rail switches, and more. 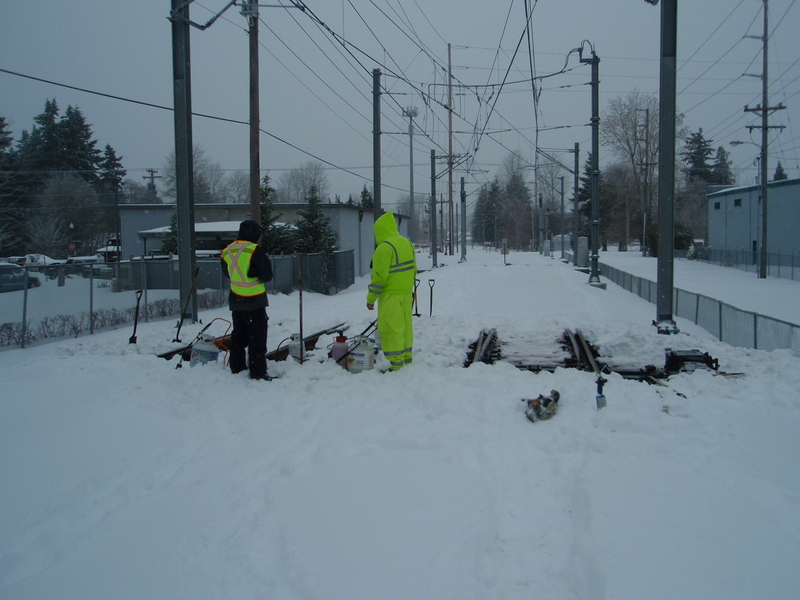 During the heaviest of the snowfall, crews battled against the elements to keep a handful of rail switches located at the west end of Steel Bridge, the Interstate/Rose Quarter intersection and at the Hatfield Government Center Station clear of snow and ice, and working. The MAX system has 251 switches throughout the system with 78 heated switches. Of the 78 heated switches, 59 are covered and they performed flawlessly over the duration of the storm. We do have heated switches that are in paved track areas and cannot be covered due to their location in active roadway. Those switches that needed the most attention from crews range in age from some of our newest to up to 20 years old. 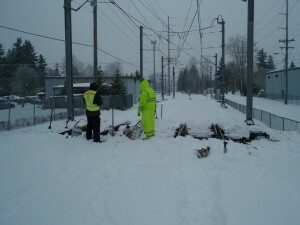 The heaters on those switches couldn’t melt the snow and heat up the switches fast enough due to the snow depths and cold temperatures, and, in some cases, high light rail traffic that continually pushed snow and debris into open switches. 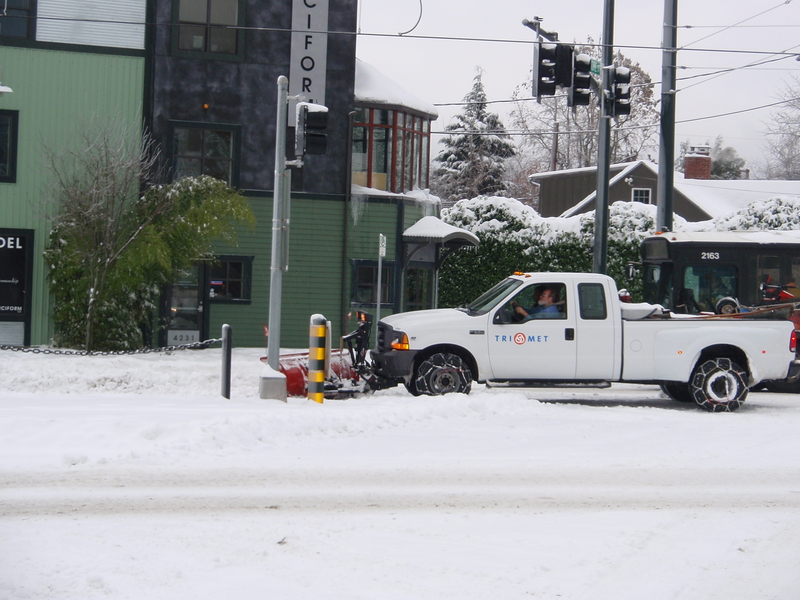 When the automated equipment couldn’t overcome the extreme conditions, TriMet crews stepped in. This led to delays, just as the extreme weather conditions created delays for automobiles, buses, Amtrak and airplanes. 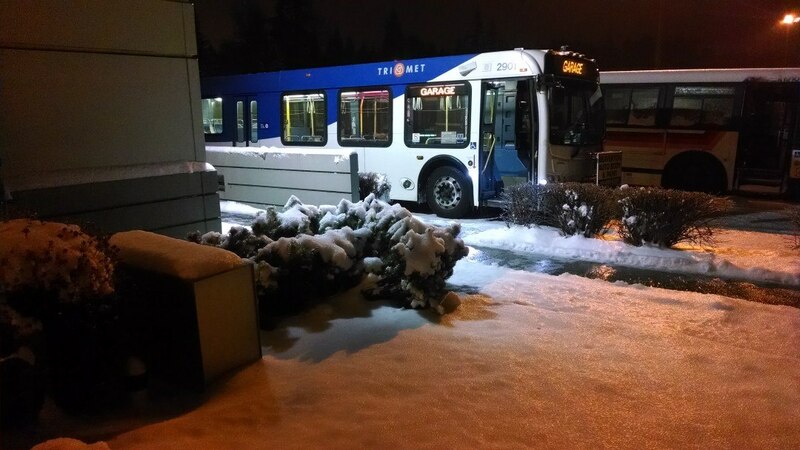 We regret the inconvenience to those riders who found themselves out and about when the most extreme weather hit on Saturday evening, causing us to shut down all MAX service for only the second time in TriMet history. The last time was the so-called “40 Year Storm” of 2008. The freezing rain moved in quickly and brought more moisture than expected. 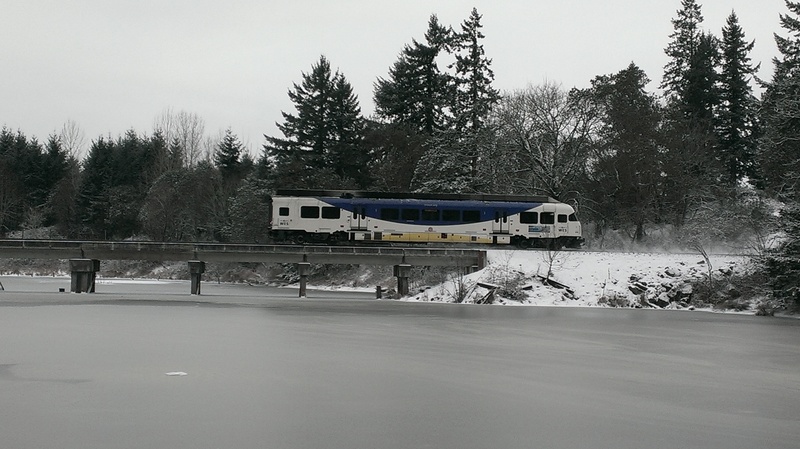 Ice overwhelmed the MAX system and trains could not move. The biggest challenge was the ice forming on the overhead wire and icicles quickly forming on the ice caps that we have covering sections of the wire. When a train’s pantograph came in contact with icicles or ice on the wire, it was not able to get the exchange of power that it needs to keep moving. The MAX system is vital to our region and we do not take shutting it down lightly. TriMet personnel did everything to try to keep it going but it was impossible to keep ahead of the extreme weather conditions. 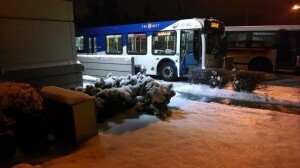 While MAX service stopped at 7:30 p.m., TriMet service did not. We dispatched buses to meet trains and transport riders to their destination stops. Until buses arrived, we had riders wait onboard trains to keep warm. These shuttle buses faced challenging road conditions. Some riders were fortunate to only have to wait about a half hour but most riders probably waited an hour or two as chained buses slowly and carefully made their way to the stations. There may have been a few isolated cases where delays were longer, and for that we apologize. The extreme nature of this system became obvious when the City of Portland sent out a plea on Saturday night urging people not to travel and followed that up on Sunday morning with the City’s first ever Wireless Emergency Alert (WEA) sent to Multnomah County residents’ cell phones re-iterating that message. We truly appreciate our riders who were patient and understanding in the face of these extreme conditions. Due to the hard work of our crews as well as equipment put in place in the last several years, the MAX system went back into limited service at about 11:00 a.m. Sunday, after about 14 hours of downtime. We actually had 11 trains running before we broadcast to the public that the system was operating, albeit in a limited capacity. We wanted to have enough trains out for arrivals at least every hour on most lines before we encouraged use. The storm wasn’t a challenge for our WES Commuter Rail. The heavy rail trains chugged on through the conditions and stayed on schedule during the Thursday, Friday and Monday commutes. We received a special emergency plea on Saturday night, February 8, from Portland city commissioners Nick Fish and Steve Novick to help out hospitals. Several local area hospitals were at or near capacity because patients ready for discharge were unable to get rides home from loved ones or taxis due to the treacherous road conditions. We coordinated with the contractor of our door-to-door LIFT service, First Transit, to transport patients home. Our resources were limited, but it demonstrated the commitment and partnership between the City of Portland, TriMet, First Transit and the community. With Portland Public Schools, government agencies and some businesses closed during much of the storm, we expected to see lower ridership. . However, we saw a huge uptick in average bus ridership the two days following the storm, jumping roughly 20,000 riders per day over the January average. We are still awaiting ridership estimations for MAX and WES. In the coming weeks, TriMet will debrief and review our storm preparedness and response in detail to identify potential areas of improvement. Our team will also review all comments received from the public to ensure all issues are being addressed. An update on our storm response will be provided to the TriMet Board in the coming months. This was a total team effort and we again want to thank all of our dedicated employees for their critical contributions, our regional partners for their aid in keeping the system moving, and our riders for their patience, understanding, feedback and continued ridership.